As awesome as last year’s theatrical adaptation of Stephen King’s IT ended up being – and as much as I look forward to the sequel – there will always be a special place in my heart for director Tommy Lee Wallace’s 1990 ABC miniseries take on King’s killer clown. Okay, to be fair, IT isn’t really a killer clown. As any King fan knows, Pennywise is but one of the many terrifying forms the titular monster assumes in the book. 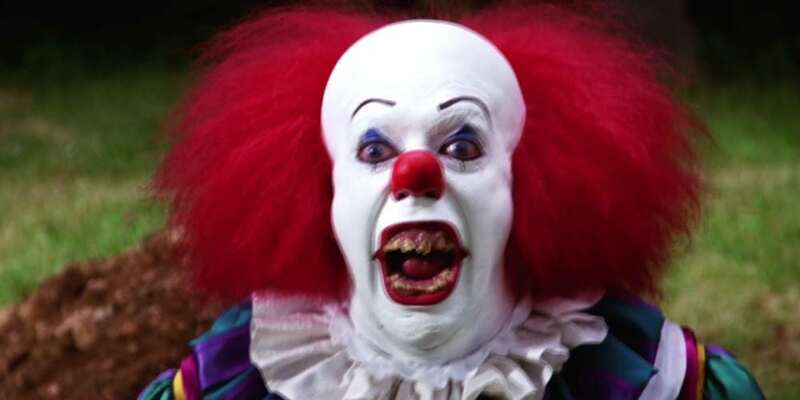 For understandable reasons though, Pennywise tends to be IT’s form 90% of the time onscreen. Before Bill Skarsgard wowed audiences in 2017, Pennywise was of course originally portrayed in the miniseries by genre legend Tim Curry, star of Legend, The Rocky Horror Picture Show, and countless other great movies and shows. Yet, for most of the nearly 30 years since IT premiered on TV, Curry has been reluctant to discuss playing perhaps his most famous character publicly. That’s one reason fans are so hyped for the new documentary Pennywise: The Story of IT. In the style of other fan-made docs like Never Sleep Again: The Elm Street Legacy and Crystal Lake Memories, Pennywise goes inside the making of IT (1990), and features interviews with dozens of cast and crew members, including Curry. Now, Dead Mouse Productions has revealed the striking Blu-Ray cover art of the documentary, which unfortunately still has no firm release date. Check the art out below, marvel at how awesome it looks, then go pre-order the movie, cause it’s shaping up great.